ChickChat: picture, thousand words, you know the saying. Most Aussies around my age would have a photo like this stashed away someplace. Note the stylin' fashion of 197... umm... going out on a limb here, maybe 73? The haircuts, where we all look like we had a bowl plonked on our scones and someone snipped round it with the kitchen scissors. The very politically incorrect gun slung round my (boy) cousins' neck. Pictured here are cousins from 3 families. Our dads were brothers. We grew up fairly close geographically, but not always close emotionally. The two 'big' girls sitting in front are my cousin Jo and I. We are only a few months apart in age, so we grew up together, and though we had childish spats from time to time, she was an integral part of my childhood. We went to roller-skating and discos together, we went to the footy and perved on Boys, and swimming down the 7 foot (local waterhole). See the house behind us? that's Nanas' place. I loved that house, adored the windows (one day I'll put some into my own home) and the house was all unpainted timber inside, high ceilings and friezes, and gorgeous old furniture. There was a massive mulberry tree on one side of the house, which we loved even as it stained us purple, and she had a water-tank turned into a wood-shed down the back that fascinated and terrified me because of spiders. There was a free-standing wooden garage at the side, with the first car-pit I ever saw. The floor was all timber, and stained with oil and various other mechanicalish fluids. It had a mysterious smell and feel to it, that shed. If I close my eyes, I can almost smell it. And the car, that apple green ute belonging to my uncle (and apparently it was his pride and joy). That brings back the most memories. My sisters and I often talk about that ute. We used to go camping a lot when we were kids. Camping always involved that other great Aussie pastime, fishing. Dad and Uncle Bruce were mad fishermen, and they would chuck all of us kids in the back of the ute, and squash us in with a heap of camping gear and some blankets to wrap ourselves in, and off we'd go. Five little kids, unrestrained in the back of a ute, roaring along skinny little bitumen roads and then bumping along rutted, dusty tracks to some place in the middle of absolutely nowhere, to set up camp and fish for a few days. Uncle Bruce used to make us sing. If we stopped, he'd eventually notice, and bang on the roof of the ute, yelling "SING! you kids. SING!" We'd arrive with parched throats and half a ton of dust in our hair, but totally happy. And none of us ever fell out. How different things are today! I wonder what my own kids will feel nostalgic for, when they look at photos from their own childhoods? Memories are such wonderful things. I can almost see the scene set out before me as I read your words. I wish I could import the smells, too. Mulberries, MMMMMM. I remember the smell of the woodheap. And the wisteria on the front fence. And Jimmy's shed was like another planet - only the truly brave would venture there. I had forgotten the wisteria!! how NAKED did the gate look when it got cut down! I remember the pre-seatbelt era. I remember walking to the library one day when I was maybe 8 and seeing a station wagon towing a trailer full of furniture bits and pieces and there were kids in the trailer hanging on to stuff so it didn't fall out going around corners. Imagine the hoo-ha if that happened today! Weren't we absolute DARE DEVILS back then!! If my husband tried any of that nonsense with our kids, there'd be BIG TROUBLE. But I loved it myself. I grew up on a wheat farm and Dad worked really long hours. I remember how for a treat Mum would pack a picnic. 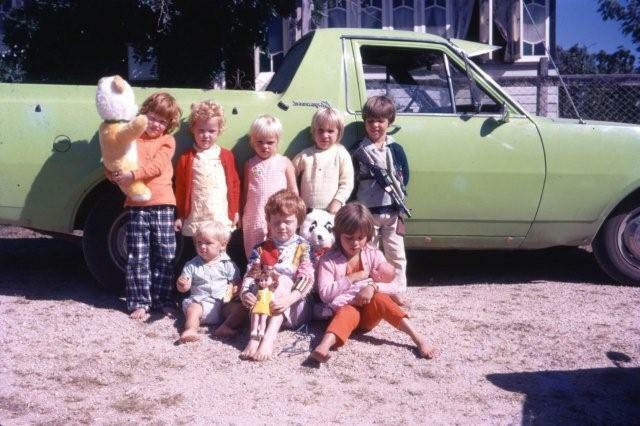 My younger twin sisters would sit inside the ute with the folks and my older sister and I sat in the back on beanbags. We'd go driving and find a nice spot on the farm for lunch. My fondest memories are the most simple pleasures. That sounds SO lovely! it must have been a huge amount of work for your mum, on top of what was already a busy day, but what special memories!